Symantec has released its Norton CyberCrime Report for 2011, and if you thought business was good for smartphone and mobile device makers…well, business appears to be good for cybercriminals too. According to Symantec, some 431 million adults worldwide were victims of cybercrime in the last year, with the total cost of those crimes amounting to some $114 billion. 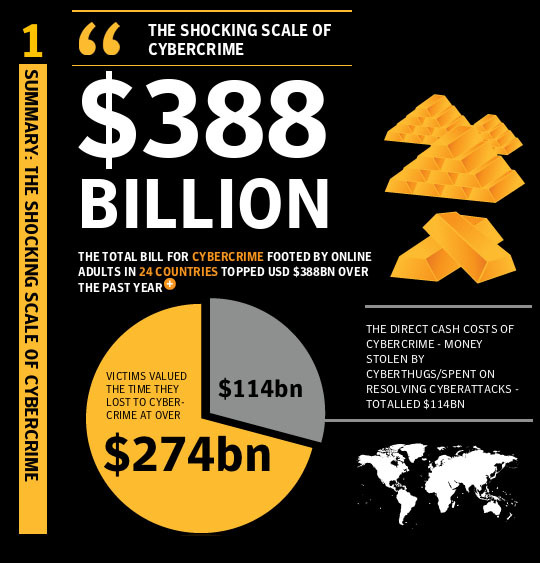 And when Symantec figures in the value of the time victims lost to that crime, the cost goes up another $274 billion to $388 billion. If those figures hold water, it potentially makes the the cost of online crime worldwide larger than the global trade in heroin, marijuana, and cocaine combined. According to the report, over two thirds of online adults say they have been a victim of cybercrime in their lifetimes—and Symantec reports that 10 percent of adults say they have been victims of online crime on their mobile phones. Illustrating the disconnect between users’ awareness of cybercrime and what they do about it, Symantec says that 74 percent of respondents in its survey said they were always aware of cybercrime, but 41 percent of respondents don’t use an up-to-date security package to protect their personal information. The rate is even worse amongst mobile users: Symantec found just 16 percent use up-to-date mobile security products. Further, Symantec found that less than half its respondents reviewed their credit card statements regularly for fraudulent activity, and a whopping 61 percent either don’t use complex passwords or change them regularly. Of course, some of Symantec’s assessment of respondents security habits is self-serving: the company develops Norton Antivirus and other security software, and the survey doesn’t say whether it takes into account users on Mac OS X and other platforms that, to date, haven’t experienced anywhere near the level of malware and security threats to which Windows users are subjected, and hence have a far lower real-world need for up-to-date security software. And who are the most likely victims of cybercrime? According to Symantec, it’s men aged 18 to 31 who access the Internet from their phone. Symantec’s survey covered over 12,700 adults in 24 countries, and was conducted in February and March 2011.